Planet Iggy is a collection of short stories with an adult theme to them. From doggy parties and show ring gossip, to dogs forming their own boy band, it offers pet lovers the chance to imagine what their own dogs would say if they could talk. Ten percent of every book sold will be donated to the Italian Greyhound Club of Western Australia to assist the club with the great work that they do for the Iggies including any that come into their care for rescue and re-homing. 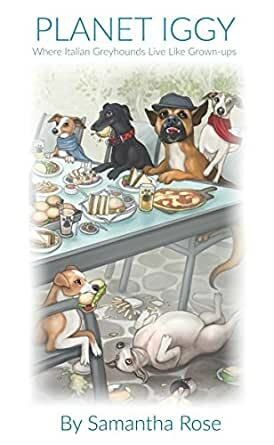 5.0 out of 5 starsA book for dog lovers. A great read for anyone who ever has conversations with their dog. A whimsical read akin to Beatrice Potter - only for adults. Do yourself a favour and read this with a good cup of tea (and piece of chocolate cake). 5.0 out of 5 starsTerribly adorable. Such a sweet book with cute illustrations. What little characters Iggies are. If you have ever known an Iggy, you will find the antics of the characters so humorously and cutely portrayed in this book quite believable. Not only Iggies, but other dogs are brought to life in this visit into Planet Iggy where unbelievable yet believable things happen. It's fun, it's sweet and the author is so obviously in love with and in harmony with Iggies and all animals.